While mining is not now a major part of the Pacific Northwest states economy, in the past metals mining was a significant resource. Gold, copper, nickel, and other minerals were developed starting in the 1860's, reached their heyday around 1900, and have continued to the present at a reduced level. 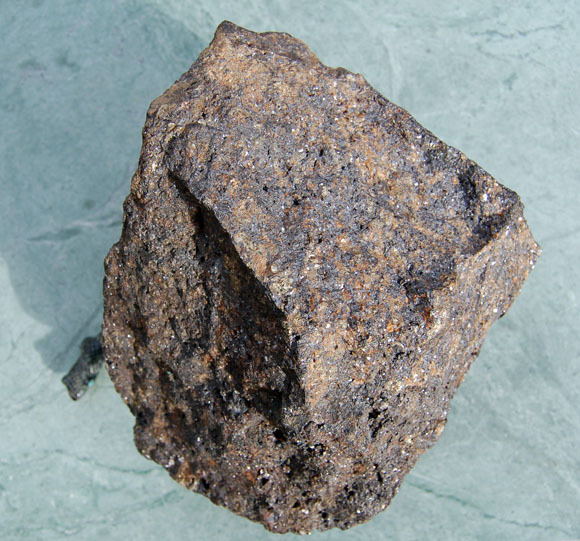 This photograph is of a block of massive copper, zinc, and lead ore from west central Oregon. Photograph by B.W. Rogers. Download Open-File Report 95-688 as a PDF file (2.9 MB). Download the Significant Metallic Mineral Deposits Dataset in compressed (**.Z) Arc/Info Export format (75 kb download file, 194 kb uncompressed). Download Additional Datasets needed to re-create the paper map in a GIS. This file is in UNIX compressed tar format (**.tar.Z) and includes 5 coverages in Arc/Info Export format that includes ICBEMP Ecological Reporting Unit boundaries, study area boundaries, state boundaries within the study area, 1:2M lat/long corner tics, and 1:2M lat/long interior tics (521 kb download file, 1 MB uncompressed). Download Text and AML files needed to re-create the paper maps in a GIS. This file is in UNIX compressed tar format (**.tar.Z) and includes 6 ASCII files that includes Arc/Info plot AMLs, key files, and explanatory text (13 kb download file, 22 kb uncompressed). Download Map prepared from the digital dataset, in compressed (**.Z) HPGL2 format (184 kb download file, 371 kb uncompressed HPGL2). The map scale is 1:2,000,000. The map sheet size is approximately 29 by 38 inches. The map is oriented with the long axis in the x-direction for plotting. This map was designed to be plotted on a HP Inkjet Plotter (model 650-C), but can be plotted on any full-color (inkjet or electrostatic) plotter that will accept HPGL2 code. Download Open-File Report 95-688 Appendix B as a Microsoft Excel file in a self-extracting zipped archive (*xls.exe) (100 kb download file, 298 kb unzipped Microsoft Excel format). Download Open-File Report 95-688 Appendix B as a dBase IV file in a self-extracting zipped archive (*dbf .exe) (52 kb download file, 494 kb unzipped dBase format). Download Open-File Report 95-688 Appendix B as a Lotus 1-2-3 file in a self-extracting zipped archive (*wk4.exe) (104 kb download file, 273 kb unzipped Lotus 1-2-3 format).